In a stand mixer, cream eggs and sugar until thick about 5 minutes. Add in vanilla extract. In a separate bowl sift flour, salt, cinnamon, and baking powder. Slowly add dry ingredients to the wet ingredients until combined. Place dough on a silicone baking mat or a baking sheet sprayed with PAM. Form dough into a log about 12 inch long and 3 1/2 inch wide. Bake for 25 minutes, or until log is firm. Remove from oven and let cool for 10 minutes on a rack. Transfer log to a cutting board, and cut into 3/4″ diagonal slices. 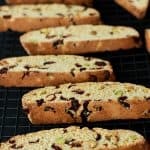 Place biscotti cut side down on baking sheet, bake for about 10 minutes, turn slices over and bake for another 8-10 minutes.